In this fitness-obsessed world; where gym is home, treadmill your pal and the staircase your daily mission, your exercise regime tops the priority list. But, really, how long can you keep doing the same old routine season after season; even the dedicated ones will need a change. Once the raindrops start and the overcast sky opens up, motivation slowly and steadily moves to zilch. Our metabolic rate also takes a lazy turn but your body needs serious movement now. Also since the cold has been proved to aid weight-loss; do just that, only with a twist. Nothing shakes up that stubborn cellulite like a change in routine. With the fitness world offering a variety of vigorous, yet fun, fitness fundas, ditch the regulars and introduce some zing while you continue with those workouts. Don't we all love those row-boat rides in our misty hill stations? Even all those weights with multiple sets and counts aren't as effective as a session of swift kayaking. Basically a lean, row boat for two; kayak racing is also a popular boating sport the globe over. Tone those upper body muscles while working up a sweat along with a partner for company and believe me its addictive. Most effective: Take a competitive partner along so you can motivate each other to sweat it out more. So all those statements about yoga being super beneficial to make our body lithe, flexible and supple are indeed true. But for all those asking 'what about calorie loss' led to power yoga, which is a technical combination of asanas designed to get your heart rate going. Flexibility with inch-loss; your perfect solution just presented itself. Most effective: Ask around and do sample classes before you zero in on the one that suits you best; do-it-at-home teacher is a no-no since power yoga needs certain particular aids that will only be available in a proper yoga class. Jaijutsu, the oldest Japanese form of combat sword fighting, is a detailed form of martial arts not commonly seen in the rest of the world. A brilliant strategy for self defence; the vigorous movements along with expert twists and thrusts result in it being a high-intensity cardio. The weight of the wooden staff (instead of swords for practical purposes) helps in muscle strengthening. Most effective: A rare form but you'll have to do a rigorous search. If you don't find a class, try kickboxing or karate instead with hand, waist, and feet weights for the same results. You've had a long week and feel like the need to stretch your legs on a day off? Try the colourful sport of paintball. Spend an adventurous day chasing each other with hue-filled pellets. Burning off flab never seemed so much fun! Ensure you gather a big gang to max on the masti meter! Most effective: This being an outdoor activity, take along friends who don't mind the downpour of paint as well as rain to avoid dropping it half-way. Now dancing is something almost everybody likes to indulge in; even the ones with two left feet, especially if you know it's gonna help you shed some inches. But aren't we all bored and tired of the same ol' run-of-the-mill Salsa/Bollywood dance classes? 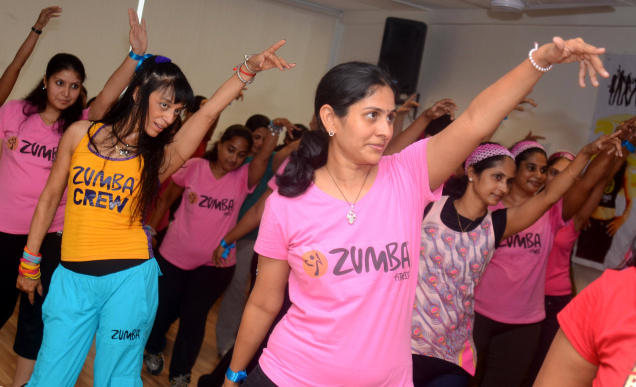 So go for Zumba, a quirky amalgamation of peppy Latin swirls with cardio beats that keep the adrenaline pumped. Another option is sensuous Arabian grooves of belly dancing; the tummy movements ensure you that tight stomach and six-pack cuts without slumming on those hourly crunches. Most effective: A class as this needs you to go alone so you concentrate on the batch instead of friends. And, hey, it's also a good way to meet new people.